April 5-7 I attended the UUA Mid-America Regional Assembly in St. Louis. 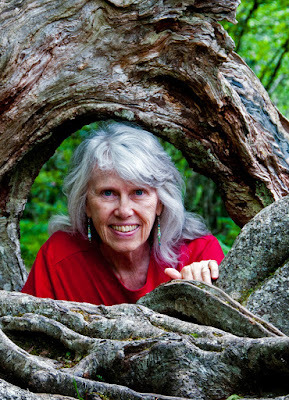 My main missions were to represent the Tree of Life UU Congregation in McHenry, recharge my spiritual batteries with inspiring presentations, and facing the challenge of pervasive White privilege in myself, my religious home, and in our struggle for social justice. Mission accomplished on all of those counts. But I had a private mission as well—to scout the usual display by the UUA Bookstore InSpirit for new-to-me poets. Alas, this year the Bookstore did not schlep its wares to Missouri. But I did find what I was looking for on the well-stocked tables of the of UU Women and Religion with the UU Women’s Federation. Nan Lundeen may be best known for her widely admired handbook, Moo of Writing: which was a finalist in the 2017 Next Generation Indie Book Awards which was based on her article, Find Your Moos, appeared in a 2013 issue of the Britain’s Writing Magazine, and her article, Relax and Renew with Moo/Mu of Writing appeared in The Paddock Review. Lundeen’s poems have been published online by The Iowa Review’s Iowa Writes, and the University of South Carolina Poetry Initiative; she was a finalist in the Yemassee Literary Journal’s 2010 Pocataligo poetry contest. The Catawba was nominated for a Pushcart Prize in 2014. She has been widely published and admired in numerous literary journals. Her journalism has been published in the Detroit News, the Grand Rapids Press, the Connecticut Post, The Greenville News, and elsewhere. Lundeen holds a master of arts in communications and a bachelor of arts in English from Western Michigan University at Kalamazoo. She is married to freelance photographer Ron DeKett. They live in rural southwestern Michigan among deer, wild turkey, hummingbirds, and wildflowers. What is intriguing about Lundeen’s The Pantyhose Declarations is its organization into three sections. Each one is a layer of the poet’s identity. 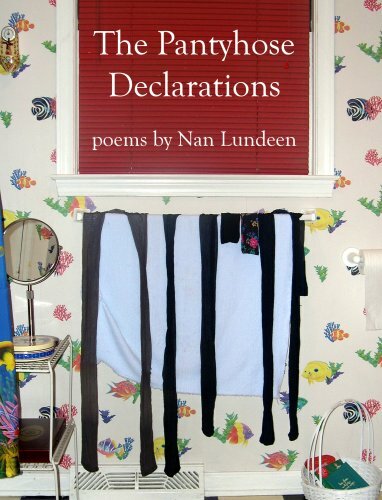 The first section “The Declarations” is her defiant but playful declarations of her feminism which is rooted in her refusal to be bound by either convention or expectation. and listen while many unburden their woes. in her very own bubble home. and wonder why a cricket chirps. or for some other reason? shy ferns hidden in the bluffs. Bosh, a little manure can’t hurt you. insisted in molasses in the rye. one night on the stairs. I don’t trust that one. For more information on The Pantyhose Declarations © 2009 by Nan Lundeen and her other work visit NanLundeen.com .